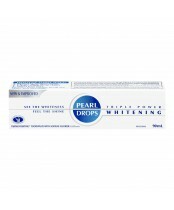 Pearl Drops Whitening tooth polish and Triple Action Whitening toothpaste help restore the natural whiteness of your teeth and brighten your smile by gently cleaning away stains. Every smile should be this polished. Pearl Drops. See the whiteness. Feel the shine.